I spent $40 today at Yahoo! to measure how many calories my body burns if I were just sitting down. I spent 15 minutes breathing in a tube and out comes a chart of how many calories I burn. 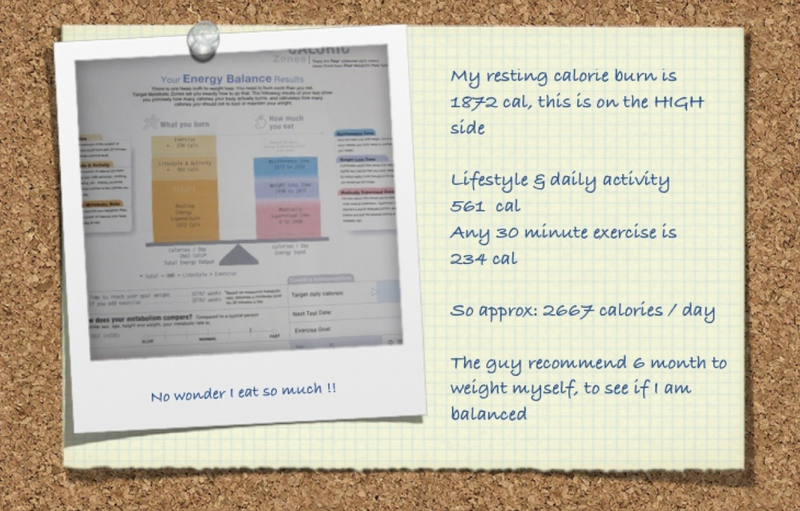 It turns out that my body burns 1,872 calories, plus 561 calories with just normal movement everyday, and if I burn 234 calories with exercise, that adds up to 2,667 calories / day. I did this test to understand why I’m snacking everyday and also to understand how much food and exercise I should be doing if I wanted to grow muscles or to loose weight. I highly recommend spending the money to understand your body.